Infused in Sweet Almond Oil (ratio herb to oil 1:5). Calendula Oil has anti-inflammatory, anti-spasmodic, and vulnerary (aiding healing of wounds) properties. This infused oil is wonderful for skin infections, wounds, rashes, bites, minor burns and inflammation. 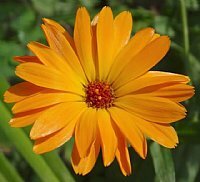 Calendula has also been used to help with the healing of scars and for eczema. It is rich in carotene and saponins, and is excellent for damaged skin. Calendula oil is so gentle and healing that it's appropriate for babies, especially for helping to heal diaper rash. Recommended for mixed and oily skins, calendula oil is somewhat cooling and slightly drying. "Wonderful calendula oil from somatherapy!!!!" Review: I have been ordering calendula oil for a sew years and I would not go anywhere else. It is the best I have ever used. NEVER run out, please!! !